Nissan Patrol & Safari are well known for their strength & reliability all over the world. Out of the box they feature some pretty great drivetrain, but they do have their limits. The H233B front differentials are massive, but the factory axles and CV joints are the week link, and are not built to withstand the added stress of larger tires and heavy off road use. Additionally, the OEM joints are 27 spline where the inner axle connects to the joint creating a weak Neck-Down. 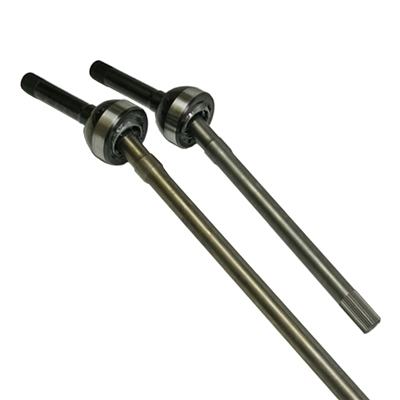 Nitro Gear & Axle has addressed this by increasing this to 30 spline by offering a range of Heavy Duty Chromoly Birfield Joints & Axle Shafts. - NITRO 30/30 Chromoly CV Axle Kits for Nissan Patrol & Safari are an easy upgrade and fit with Standard OEM differentials or Aftermarket Lockers. - High strength Chromoly Material featuring State of the art machining, heat-treating and polishing processes for uniformity and ultimate in strength. TOYOTA FJ40 & FJ60 LANDCRUISER Right Hand INNER AXLE SHAFT (30 SPL) 17.3"
Toyota LJ70 & RJ0, Landcruiser II, Bundera Right Hand Inner Axle Shaft (30 Spl Birf only!) 16.3"